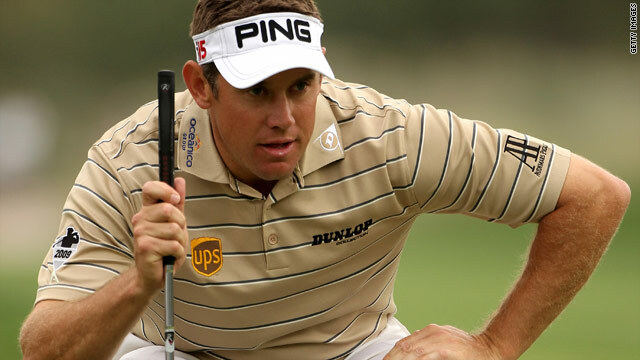 English golfer Lee Westwood is looking to clinch his first title of 2010 with another victory in Dubai. (CNN) -- World No. 4 Lee Westwood goes into the final round of the Dubai Desert Classic in a four-way share of the lead following his four-under-par 68 on Saturday. The European Tour No. 1 is set for a shootout with halfway leader Thongchai Jaidee, veteran Miguel Angel Jimenez and another Spaniard, Alvaro Quiros, as he seeks his first title this season, with defending champion Rory McIlroy lurking two shots back in fifth place. Westwood was third last weekend at the Qatar Masters after going into the final round one shot off the lead, but is seeking to repeat his success from his last event in the Emirate when he won the season-ending Dubai World Championship to clinch the tour's money list crown ahead of McIlroy. "I'll play aggressively, I won't do anything stupid, but I'll shoot at the flags that need to be shot at," the Englishman said, having missed a long eagle putt at the last which would have given him the outright lead. "If I keep playing the way I am and get off to a quick start I'm going to have a chance coming down the last nine holes." Asian No. 1 Jaidee had led by four strokes on his opening nine holes, but the Thai was caught by the other trio after parring the second half of his third round to card 69. The 46-year-old Jimenez started with two early birdies but then dropped shots at six and 10 before reeling off three birdies in four holes and then another at 17, but could not take further advantage at the par-five 18th as he ended with 68. The big-hitting Quiros made a relatively slow start but picked up shots at 10 and 13 and then birdied his last two holes for a flawless 67 to give him a fighting chance of earning his fourth tour title. World No. 9 McIlroy bogeyed his opening hole but bounced back with birdies at the fourth, eighth and 14th holes, then another one at 18 left the 20-year-old Northern Irishman well-placed for a tilt at the title on Sunday. His total of nine-under 207 left him one stroke ahead of Italy's Edoardo Molinari and Australian Marcus Fraser, who both shot 70. Germany's Martin Kaymer carded a bogey-free 68 to be eighth on seven under. Meanwhile, Dustin Johnson took a one-shot lead at the halfway stage of the U.S. PGA Tour's Northern Trust Open after completing his delayed second round on Saturday. The American moved above clubhouse leader Steve Stricker with a birdie at his final hole to card a four-under-par 67, having been left with two to play when bad light curtailed play on Friday. Stricker carded seven birdies in his six-under-par 65 on Friday, giving him a two-round total of 132. Argentina's Andres Romero held onto third place, three shots back, after carding a birdie and two bogeys in the three holes he had left to complete as he signed for a 69. England's Justin Rose was tied for fourth with New Zealand's Tim Wilkinson, who also shot 67, and American Kevin Stadler (71), while Japan's Ryo Ishikawa joined that group on Saturday as he fired a birdie at 17 and completed a 68. World No. 2 Phil Mickelson, seeking a third successive title at the Riviera Country Club after beating Stricker to win last year, shot 66 on Friday to be tied for 11th on 138 with South Africa's Ernie Els (70), American Brandt Snedeker (72) and Britain's Luke Donald (70). Three-time major winner Padraig Harrington missed the cut by one shot in his first U.S. outing this season as he bogeyed 17 and carded a 73.